For as little of the population as actually has experience belonging to a union, it is interesting how many think favorably of unions. Although only 10.7% of all wage earners (and only 7.6 percent in the private sector) belonged to a union in 2017, yet 55% of all workers hold a favorable view of unions while only 33% an unfavorable view. This probably has much to say about storytelling. Most businesses (and their employees) focus on promoting their products and services to the marketplace, whereas unions have only “membership” to sell to prospective members, and are masterful at providing voice to the minority of disaffected workers, and twisting economic news in their favor. Regardless of what Americans say in a poll, they’ve been voting with their feet. 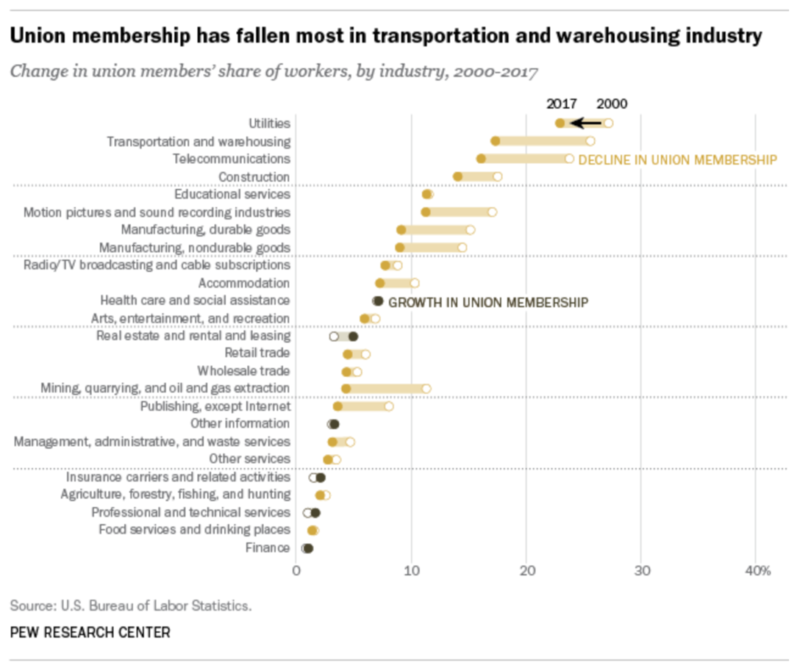 The graphic below indicates the union membership losses by industry from 2000 to 2017.